One of the best parts of the school year coming to a close is that I no longer have to pack lunches. After weeks and weeks of packing lunches for three children, I can say with certainty that most days the lunches I packed fell in to the “more of the same category.” Sandwiches. Cheese sticks. Yogurt, Greek or drinkable. Drink, juice or milk. Cookies. Chips. Fruit. You name a day of the week and the lunch I packed probably contained at least 3 of the above-mentioned items. Now, there was one bright spot in my lunch making endeavors. One little item that I casually threw in to the lunch bags one day. The item in question was proclaimed to be the best lunch item ever. Ever! I’m not kidding about this at all. My teen was the one who made this bold assertion. She is a picky eater. Hard to please. And would much prefer to buy lunch each day. Would prefer to make her own lunch, but often does not have time due to homework, chores, and activities. Well, I was shocked when this kid devoured a new snack…Raisels. Gobbled them. Did I mention that she is a picky eater? She even demanded to bring a couple of boxes to school a couple of days in a row. Apparently the Raisels were a hit with the high school crowd. Who knew? I have to admit that I was surprised. She tends to balk at trying new foods for lunch. Really, teens are not a million miles away from toddlers in many, many respects. Do you remember how picky your toddler could be/is? Well, teens are just as picky and since they talk more than toddlers are more vocal in their likes and dislikes. My teen has her tried and true go-to foods for lunch, and everything else is looked at with suspicion. Until now. The Raisels were a hit with me, too. 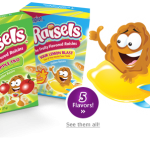 Raisels are the latest snack from the National Raisin Company. If you are thinking of those little yellow boxes of raisins…think again. Raisels are 100 percent fruit — and taste like candy. I’m not kidding when I tell you that I chomped on Raisels during a couple of very long volleyball tournaments that my teen played in. In the waning hours of the all-day tournament, I kept myself going with a box of Sour Apple, followed by Sour Orange Raisels, and finally the Sour Lemon Raisels. Each box is in a 1.25 ounce box — a portion controlled snack. A convenient lunch, snack, or on-the-go treat. Available in Sour Apple, Sour Orange, Sour Lemon, and Sour Peach. I loved all of them. My teen preferred the Sour Peach and Sour Lemon. No sodium, high fructose corn syrup, or artificial sweeteners. Kosher certified by the Orthodox Union. Contain 100% of the recommended daily allowance for Vitamin C.
Find out more about Raisels. Where can you buy Raisels? Find out here. Fun activities for kids on the Raisels site. 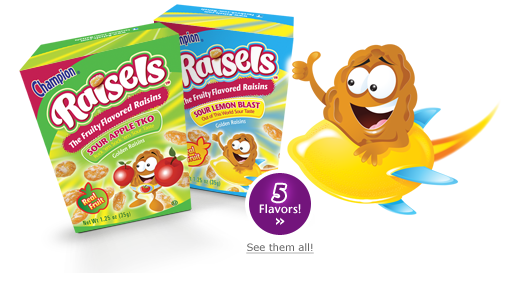 I was given a sample pack with all four flavors to facilitate my review of Raisels as part of Team Mom. The views expressed in this post are my own. I follow the tenets of Blog With Integrity. Thank you Team Mom, we appreciate your comments; remember to try our new Watermelon Flavor.